Ahmed Zeeshan has been putting out some amazing content on Google+ lately. GPlusInfo already shown you his creative use of Circles, along with his take on Google+ for the average Facebook user. Now he’s back with what he calls the Google+ Starter Pack. It’s an impressive list of instructions and tips to help a new user get started. I’ll post the current content of it here, but I strongly recommend you visit his Google+ post for the latest info. - In the left sidebar you will see the Google Talk widget that you can use to chat with your friends. You can do 2-way video calls with it too. - Again on the left, you will see a block titled Sparks. With sparks you can get interest-based content from the internet through google. - On the right you can click the green button to start a Hangout. Hangouts allow you to have 10-way group video calls… Yes, you can have a video call with upto 10 people at the same time on google+ all for free!! - You can share any type of media with the Share Box in the center of the page. - Simply move your mouse over a person’s name and add them to your Circles. Now, whenever that person shares content publicly or directly with you, you will see it in your Stream section. - If that person also adds you to their circles, then they will see your content in their Steam that you share publicly or with the circle that you’ve added them to. - So if someone is following you and you don’t know them, then you need not worry because you don’t have to add them to your circles and they will only see what you share publicly with the whole internet i.e. If you share something with your circles exclusively then theywon’t see it. - You don’t need to follow people you don’t know and consequently they will not see information that you share exclusively with your circles or specific people. 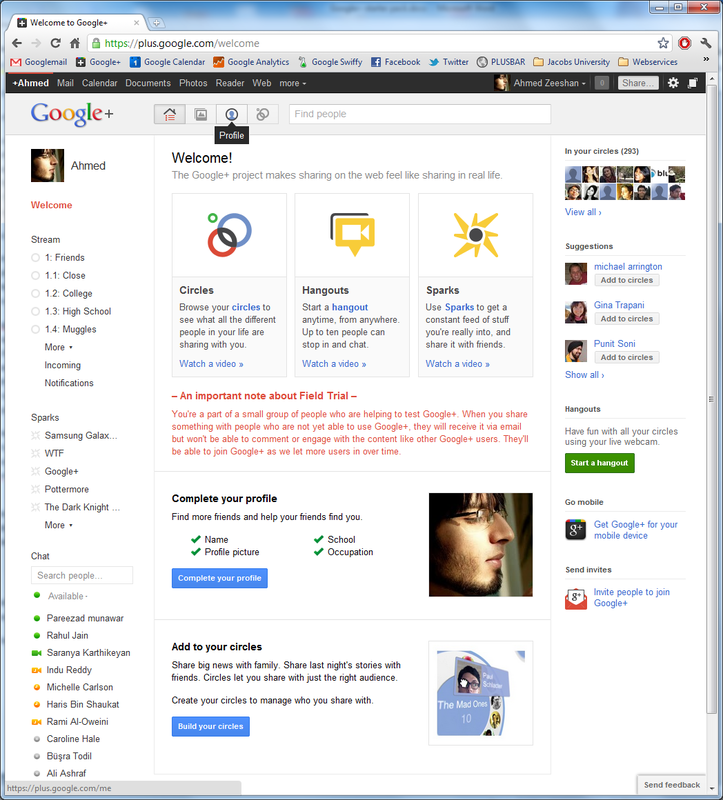 That is all you need to know to setup a profile on Google+ and to become an integral part of the social network. I hope that helped you settle right in to the Google+ Community. If you found this guide useful, then please share it with your friends to help them out too. If you have any questions or need help with any g+ features, please bug me anytime. Already using Google+? Follow Mashable News for the latest about the platform’s new features, tips and tricks as well as our top social media and technology updates. Are you addicted to Google+ like millions of others early adopters? 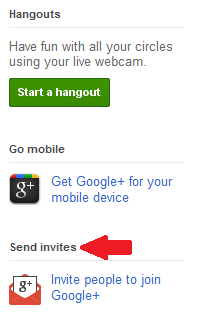 Do you spend your Saturday nights hanging out in Google+ Hangouts? You’re not alone. As Google releases more invites to its social network, more people are trying to learn the ins-and-outs of the Google+ ecosystem. We’ve already taught you how to upload iPhone photos to Google+, make a Google+ desktop app and get your own Google+ vanity URL, but there’s still a lot to Google+ ewe haven’t mastered yt. That’s why we were excited when we stumbled across a Google+ cheat sheet, whose origin we’ve traced to Google+ user Simon Laustsen. 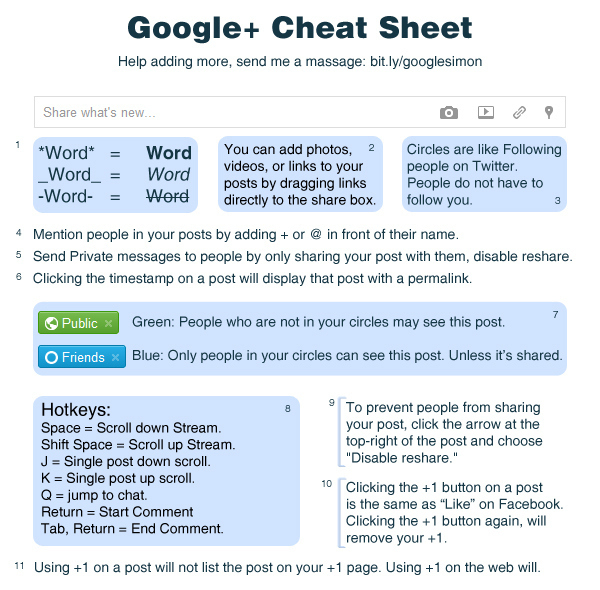 The cheat sheet includes most of the common syntax, hotkeys and tips you need to know to use Google+ like a pro. We’ve embedded the English version of the cheat sheet below. If you’re one of our many international readers, we have good news for you: it’s been translated into a dozen languages already.